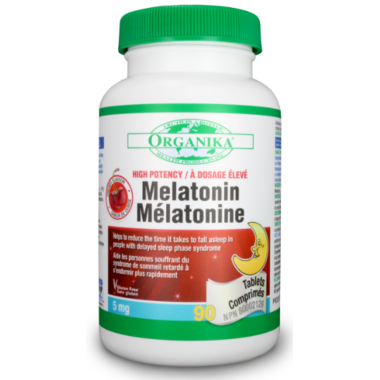 Organika Chewable Melatonin helps to aid your sleep cycle. Reduces and prevents jet lag from extended periods of travel and helps to aid the sleep cycle and restore circadian rhythm for better sleep. It also helps support healthy energy levels by improving overall sleep quality. Directions: Place 1 tablet under the tongue until dissolved, once daily at or before bedtime. Non-Medicinal Ingredients: Mannitol, Sorbitol, Croscarmellose Sodium, Stearic Acid, Natural Cherry Flavour, Magnesium Stearate, Silica, FD&C Red No. 40, Xylitol, Maltodextrin. Caution: Consult a health care practitioner prior to use if you have a hormonal disorder, diabetes, liver or kidney disease, cerebral palsy, seizure disorders, migraine, depression and/or hypertension, or if you are taking blood pressure or sedative / hypnotic medications. If symptoms persist continuously for more than 4 weeks (chronic insomnia), consult your health care practitioner. Do not use if you are taking immunosuppressive drugs. Do not drive or use machinery for 5 hours after taking melatonin. Do not use if you are pregnant or breastfeeding. I have had success with other melatonin products in the past, but these did nothing for me. I do still really like this brand for other supplements & vitamins.